Come football season there are certain foods you can guarantee will be ordered all over the U.S.: chicken wings, nachos, and stuffed potato skins. 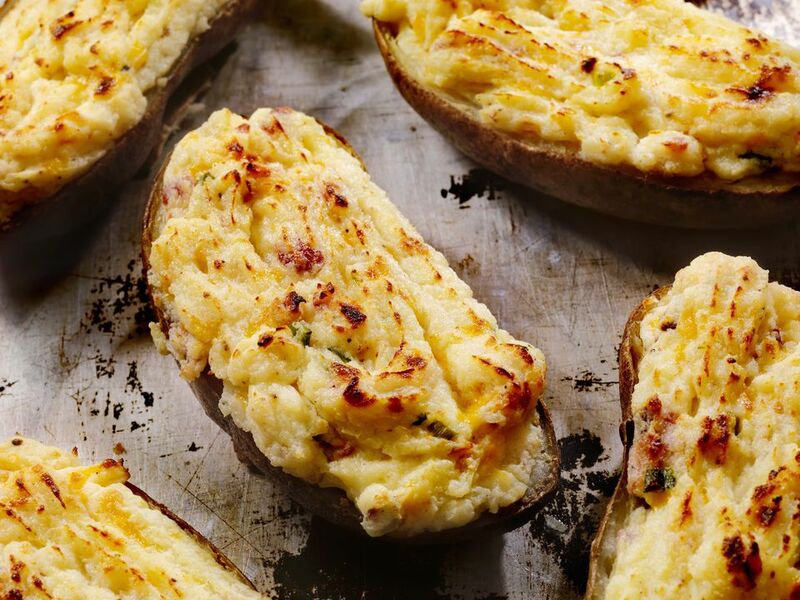 Take a closer look at the illustrious baked stuffed potato, also known as the twice baked potato or, simply, potato skins. Baked stuffed potatoes are made by baking potatoes, then removing the flesh and beating that with luscious ingredients like sour cream, bacon, and cheese mixed in. This mixture is piled or piped back into the potato skins, and then baked until it is puffed and golden. Large russet baking potatoes work best in this recipe. Yukon gold potatoes do not work as well since its skin is very thin and the potatoes tend to split when stuffed. You can vary this recipe by adding other ingredients like cooked onions and garlic or vary the types of cheese that you use. Another bonus is that this recipe freezes really well. Fill the potatoes with the seasoned bacon and cheese mixture, let it cool for 20 minutes, then freeze on a cookie sheet. Wrap the frozen stuffed potatoes well in plastic wrap and freeze for up to 4 months. Once frozen, bake it at 400 F for about 40 to 50 minutes or until the potatoes are hot and the tops start to brown. These potatoes are wonderful with everything from roast chicken to meatloaf and steak cooked on the grill to chicken wings. To complete the meal, toss up a crisp green salad or a sweet fruit salad. Preheat the oven to 375 F and make sure that the oven rack is in the middle of the oven. Prick the potatoes with a fork and rub with the 2 tablespoons of softened butter to coat them well. Place the potatoes right on oven rack and bake for 45 to 55 minutes or until potatoes are soft when pressed with your fingers. Remove the potatoes from the oven and let cool on a wire rack for 20 minutes. When the potatoes are cool enough to handle, carefully cut them in half lengthwise. Remove the cooked flesh from the potato skins. Leave about 1/4-inch shell of flesh and skin. Place the cooked potato flesh in a large mixer bowl. Add the 1/4 cup softened butter and beat until combined. Stir in the sour cream, bacon, cheese, salt, and pepper and beat for 1 minute until fluffy. Spoon or pipe the potato mixture back into the potato shells and sprinkle with paprika. Bake for 20 to 25 minutes or until the potatoes are beginning to turn golden brown on the edges and are slightly puffed. Enjoy them right away or freeze them.